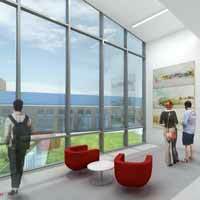 A rendering of what the Interdisciplinary Science Building will look like once completed. ST. LOUIS – Work will begin on the Interdisciplinary Science Building (ISB) later this month, it was announced at the March 1 Webster Groves City Council meeting. Crews will begin by staking out the physical perimeter of the building, then preparing the ground. The construction is expected to be completed in 2017. When completed, the building is expected to help fill the needs of the community by offering robust STEAMM (science, technology, engineering, arts, math and medicine) programs. Several studies over the years have forecast a dramatic increase in jobs in the region that require employees to have STEAMM-related preparation. A groundbreaking ceremony for the ISB was held in September 2015 and plans for how the building will look were unveiled. The building is planned to be “L” shaped and will be built just north of the East Academic Building (EAB). Joining the two structures at the north end of the EAB will make it easier to travel between the two structures. When it opens, it will house the departments of Anthropology and Sociology, Biological Sciences, International Language and Cultures, Nurse Anesthesia, Nursing, Psychology and the Institute of Human Rights. Overall, the ISB will add 25 laboratory classrooms, four dedicated classrooms, a dual computation laboratory/classroom, 51 faculty offices (with six for adjunct faculty), 20 staff offices, and a 129-seat auditorium. There also will be commons areas throughout the building for students and faculty to collaborate and hold study sessions. The building will be about 85,000 square feet. The estimated cost of the project, including all the new equipment for the building, is estimated at $44 million.